The Finnish artist Hugo Simberg (1873-1917) first painted this work on canvas (1903) and a few years later on the wall of the Tampere Cathedral in Finland. They are largely the same except that in the mural there are two chimneys in the background. Simberg became a part of the Symbolist art movement after he had met some Symbolist artists at the turn of the 20th century in Paris. The Symbolists were not concerned with a realistic representation of the world, rather they wanted to render hidden realities visible. In order to emphasize the essential idea of a work, they kept the style of painting quite simple. Simberg needed six years to turn his idea for this painting into reality. It is clearly a mature work. He loved children and painted them frequently. Especially working-class children would often earn a little extra money by standing as his models. The picture stirs up some questions: Can an angel be wounded? Who are these children? Where are the three of them going? We see that the angel has a head wound, the bottom of his wing is torn, and he is bleeding. He obviously needs medical assistance. He is holding some flowers in his hands. The boy on the right looks quite sad, his expression revealing a bad conscience. He is looking out at us, his observers, as if he wants to tell us something. Is he guilty? The boy at the left is deep in thought. When asked about the meaning of this work Simberg said: "The painting itself gives the answer. Everyone has to find it for themselves." If you would like to spend some moments meditating over this picture, you might ask yourself: Where can I find myself in this picture? Do you identify with the angel, who is hurt and wounded? Maybe an unseen piece of you is wounded, bruised and harried? Have you grown tired and now you just want to be carried? Maybe you want to keep going but you just can't make it? Do you still have flowers in your hand, remnants of some joy that has long since flown away? What is going through your head as you look at the path before you? Maybe you're like the boy on the right. Something bad has happened: a messenger of God has been hurt. He has fought against the divine order of things and the angel was wounded. Have you done something you wish you hadn't? Would you do anything to make it right again now that you are faced with the consequences? Do you need forgiveness, do you need to be set free? Or are you like the boy on the left? Your thoughts are heavy and sad because there is so much in this world that hurts God. You see how evil fights against God and all that is good. The boy's countenance reveals a certain determination. You are sad, but also focused and single-minded. You wish you had more strength to build up the kingdom of God. But the painting provides comfort as well. We see the angel is not too badly hurt, he will recover. Apparently the angel is on his way to the father arms of God. We see light coming from the left, the direction in which the path leads. God will heal the angel just as he wants to heal and restore us. Restoration takes time just as it may take time for the northern spring to appear, evident in the picture. Maybe it is slow in coming, but the air is already heavy with the smell of spring! And also for us there may be friends to help and care for us, who will bring us, just as the lame man in Mark 2, on a litter to Jesus. 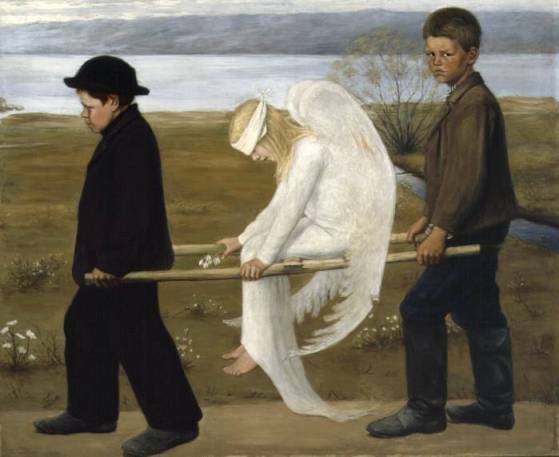 Hugo Simberg: The Wounded Angel, 1903, oil on canvas, 127×154 cm (50“×61”). Location: Ateneum, Helsinki. Hugo Gerhard Simberg (1873-1917) was a Finnish symbolist painter and graphic artist. For him Symbolism was the only way he could express his own internal world. His artistic ambitions met with little understanding. The only one who believed in him and supported him was his master, the painter Akseli Gallen-Kallela. He encouraged him even when he was publicly humiliated by others. His autumn exhibition of 1898 became a turning point in his life. Finnish critics began to take Simberg seriously. In 1898 he was accepted as a member of the Artists Association of Finland. Yet it was only after his death that the real importance of his work was recognised. Airi Rink was born in Tampere, Finland. For many years she was member of a modern dance company. After this she became a physiotherapist and studied psychology. In 1985 she and her husband founded “Crescendo”, an international ministry among classical and jazz musicians and other artists (www.crescendo.org ). She works as co-leader of Crescendo and as a psychologist and conference speaker. They have three adult children. Beat Rink was born in Basel, Switzerland. He obtained two Master degrees at the University of Basel in literature/history and theology and is an ordained pastor of the Swiss Reformed Church. He co-founded “Crescendo” and “Arts+” (www.artsplus.ch). He works as a full-time leader of Crescendo international. He gives lectures and has written the following books: Grosse Maestros, hinter der Bühne erlebt/Backstage with Great Musicians (Interview book with Franz Mohr from Steinway & Sons, New York); Mich umgibt ein grosser Klang (Interview book with 20 famous musicians - together with Franz Mohr); Jauchzet, frohlocket! Die Botschaft des Weihnachtsevangeliums von J.S. Bach; Verleisbarungen – Aphorismen (poetry).